A Big Picture Look At “Earth’s Temperature” – Quarterly Update | Watts Up With That? Please note that WUWT cannot vouch for the accuracy of the data/graphics within this article, nor influence the format or form of any of the graphics, as they are all linked from third party sources and WUWT is simply an aggregator. You can view each graphic at its source my simply clicking on it. Depending on the time frame, it certainly seems that Earth’s surface temperature has increased, though it does not appear to be “warming rapidly”. Furthermore, the surface temperature record is burdened with issues of questionable siting, changes in siting, changes in equipment, changes in the number of measurement locations, modeling to fill in gaps in measurement locations, corrections to account for missing, erroneous or biased measurements, and the urban heat island effect. Thus to see the big picture on the temperature Earth’s temperature, it helps to also look up. Note that in March the UAH Lower Atmosphere Temperature Anomaly was 0.11 degrees C above the 30 year average, and the RSS Lower Troposphere Brightness Temperature was 0.075 degrees C above the 30 year average. Keep this mind the next time you see claims that recent weather was caused by Global Warming. shows a .011 K/C per decade decrease. I am still not aware of a compelling explanation for the significant divergence in the Lower Troposphere temperature trends between the poles. 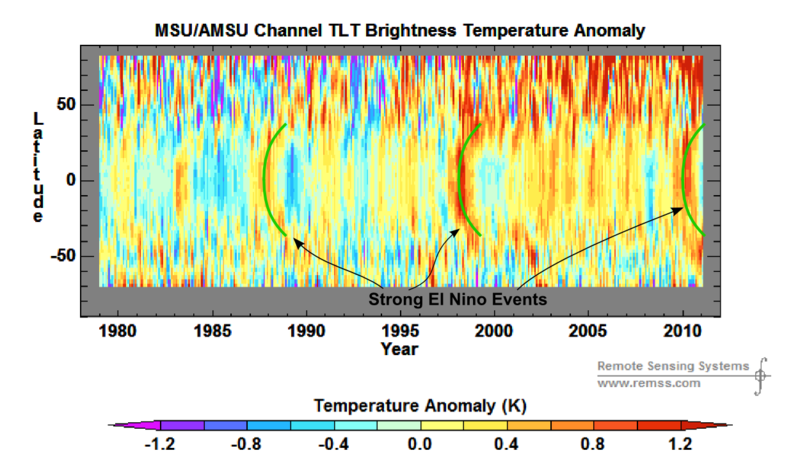 The satellite record seems to show slow warming of Lower and Middle Tropospheric temperatures, overlaid with the El Niño/La Niña Southern Oscillation (ENSO) cycle, including four comparatively large El Niño events. 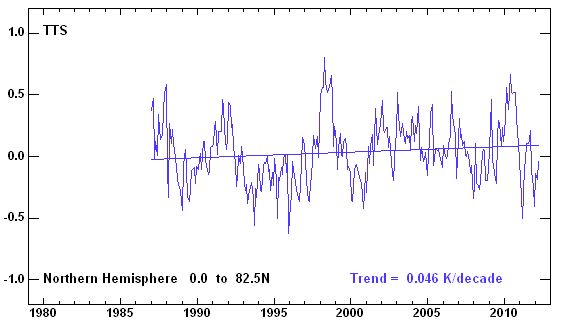 Lower Tropospheric temperatures appear to have flattened since the large El Niño in 1998 and offer no indication of Earth “warming rapidly”. It is interesting that, incorporating the impact of three significant surface driven warming events, Troposphere / Stratosphere Temperatures (TTS) have been quite stable, however there is nuance to this as well. has been decreasing by -.066 K/C per decade. It seems apparent from the plots above that Global Ocean Heat has increased over the last several decades, however Global Ocean Heat doesn’t appear to be “warming rapidly”. Furthermore, there is no evidence or indication of an increasing or accelerating rate, deceleration would appear to be a more accurate label. There appears to have been a negative trend in Northern Hemisphere Sea Ice Area and Extent and a positive trend in Southern Hemisphere Sea Ice Area and Extent, thus the resultant Global Sea Ice Area trend appears to be slightly negative. While neither Snow plot offers a global perspective, when looking at the Northern Hemisphere, there appears to have been a slight increase in Snowcover and Winter Snow Extent, a decrease in Spring Snow Extent and no change in Fall Snow Extent over the historical record. 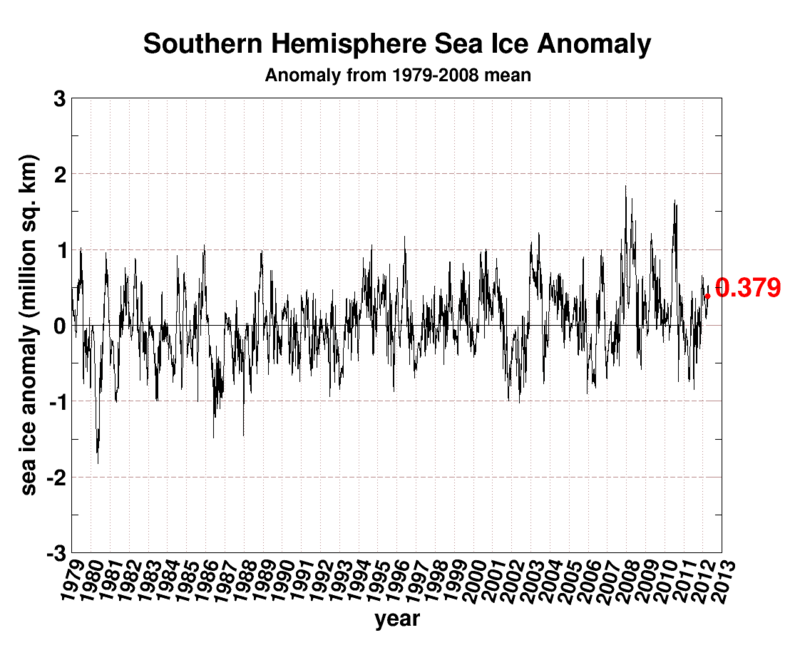 Based on the limited Global Ice and Snow measurements available, and noting the questionable value of Sea Ice Area as a proxy for temperature, not much inference can currently be drawn from Earth’s Ice measurements. 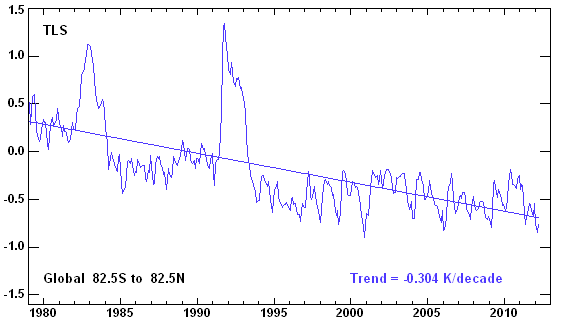 However, there does not appear to be any evidence in Earth’s Ice measurements of rapid warming. “Earth’s Temperature” appears to have increased during the last several decades, but there does not appear to be any evidence of “rapid warming”. The last 15 months suggest, to the untutored eye, that a peak in global temperatures has passed even in the GISS data. The update has been delayed in the hope/belief that this coming spring/summer will bring the trend back up to Hansen-Gore-CAGW levels. 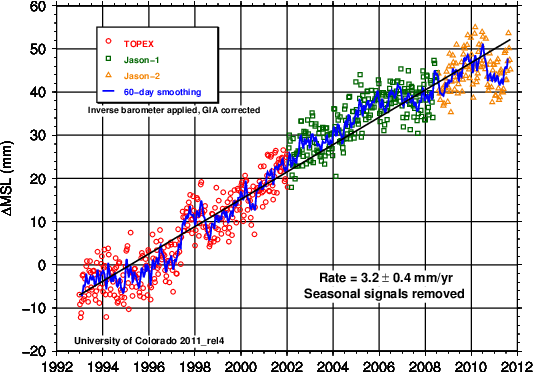 The history of adjusting temperatures up is biting NASA/Hansen et al. Like a public company that artificially boosts it stock value, the growth pattern dies if the real world doesn’t cooperate. Adjusting doesn’t work going forward, at least not when you don’t control all information. If the European and other areas go into a cool six months, the averages will be dragged down. The contiguous continental has had a “hot” winter, which looks good as a stand-alone, red splotch, but wasn’t enough to drive up the global averages. One region doesn’t a world make, despite Hansen’s best efforts. Over the next six months there will be some sharp pencils looking to delete “bad” data to maintain the storyline at NASA. The open letter by ex-NASA workers was embarrassing, but there will be greater embarrassment if the global temperatures show a decline in the next short while. Assuming unadjusted raw data of integrity remains available, confirmed by valid statistical sampling in 3-D atmospheric volume over minimum 15-year time-scales, at what point will climate botanists be willing to say: “Declining global temperatures indicate that Earth’s 125-year+ rebound from her 500-year Little Age Age is fading fast. 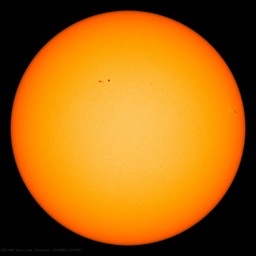 Now entering on a 70-year ‘dead sun’ Maunder Minimum, we expect an overdue reversion to cyclical Pleistocene Ice Time by c. 2113 at the latest”? Of course, any major series of volcanic outbreaks could tip Gaia to a 102,000-year full-frost regime at any time. As for catastophic anthropogenic global warming, leave that to coulrophilic, coprophagic proctocranials expert in holding feet-to-fire. catastrophic global non-warming; catastrophic to the warmists who are seeing their theories melting like the greenlad ice would have if their wishes materialised. That shows a significant decline, and is indicative of less total snow to be melted over the years. Note: The chart above hasn’t been updated with 2011 data for unknown reasons. and the “lost heat” hasn’t been found yet? curve … or should that be story? It is a bit delicious that there is not global total ice content change. Thanks! I was looking for something to write about! “Something is going on that we do not understand”. Why would “global warming” influence Spring Snow Extent, but not Fall or Winter Snow Extent? Hey, add 25 more horizontal lines to that chopped off chart and it looks more like normal variation to me…. It is a bit delicious that there is not global total ice content change. Well I would have found the graphs more interesting, if they had not been corrupted by extraneous, and uninformative noise additions. Specifically those silly straight lines imposed on the graphs, confuse the eye into believing that they somehow relate to the (presumably) measured points; they clearly aren’t related in any way. And on the first picture, the inclusion of black and red points for presumably two different data sets, combine to create an optical illusion that the semblance of increase over time is amplified. The red has the effect of depressing the earlier data, while the black accentuates the later stationary data. And of course the short 16 year long interval isn’t long enough to show any real long term climate change; although it is (presumably) a good reflection of just those 16 years. The addition of those purely theoretical model (statistical) lines, adds no information that isn’t already shown in the actual plotted points; namely that any combination of just a few spatially separated random points conveys no information about the vast unsampled space that isn’t included in the samples. 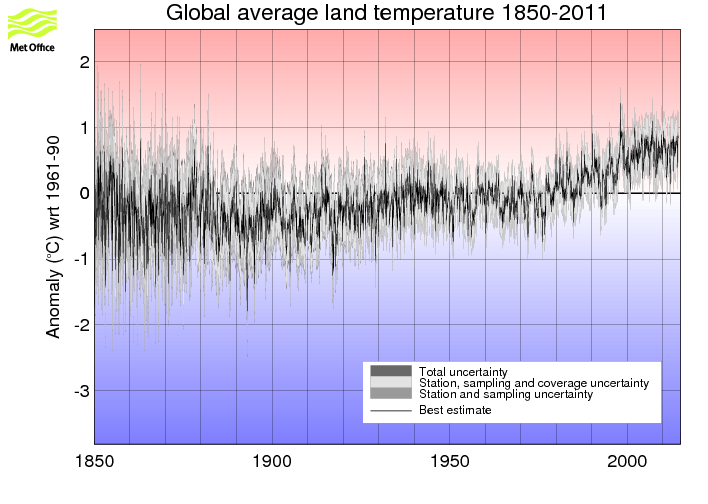 And is it possible for people to decide once and for all, whether these plots are just local anomaly values, or whether they are as is stated data on the earth’s mean surface TEMPERATURE. The earth surface, is a fairly definable location, generally a continuous phase boundary between gaseous components, and either liquid or solid components of the physical planet. How many of the plotted data locations are actually on this boundary ? Statistical mathematicians; who presumably are NOT climate scientists; should know that INFORMATION is lost, when applying statistical methods to raw observational data; and fictional pseudo data is created that can not be measured anywhere in the real world. …it looks like total yearly snowfall is indeed decreasing. That ties in with observed lower stream flows (http://www.ecy.wa.gov/climatechange/reducedsnow_more.htm) as well. Urbanization plus UHI plus snow plowing. Nothing like a few million lane miles of blacktop exposed to reduce snow cover. Sounds like this global warming is not much to write home about. Kinda pales to people gettin lost in a snow storm and having to survive on…well…let’s just say whatever you can scrounge up along the Donner Party trail. Well, that’s it then. Anyone who can make a catastrophe out of this needs his head examined. I will try to get this post published in one of our national newspapers. A 0,039% chance that I will succeed, but it’s worth a try. Here are the stats for 4 different data sets over the last 15 months. 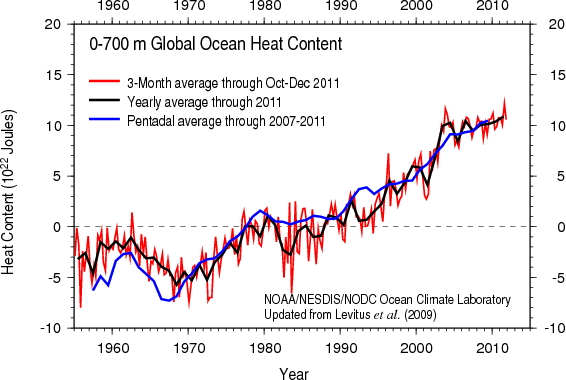 RSS: 2011 was 12th warmest at 0.147. The first 3 months of 2012 so far are 26th warmest averaging -0.034. 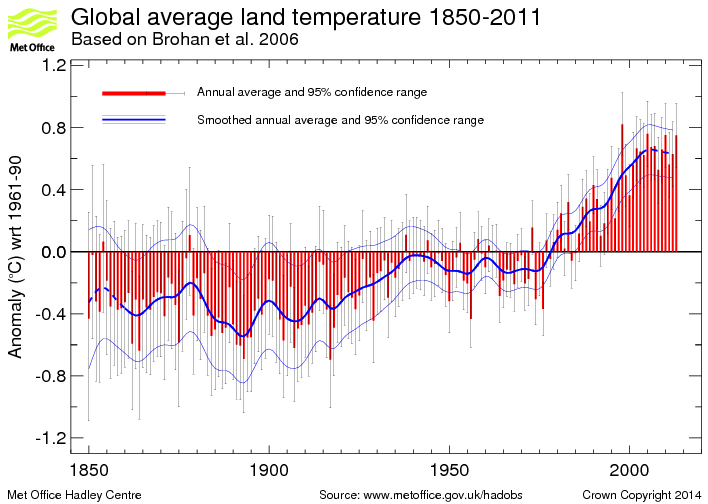 UAH: 2011 was 9th warmest at 0.153. The first 3 months of 2012 so far are 18th warmest averaging -0.031. 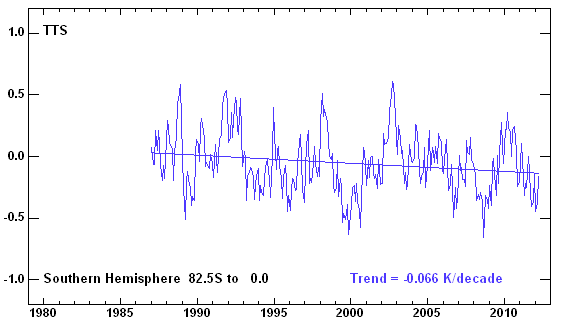 GISS: 2011 was 9th warmest at 0.514. The first 3 months of 2012 so far are 14th warmest averaging 0.407. 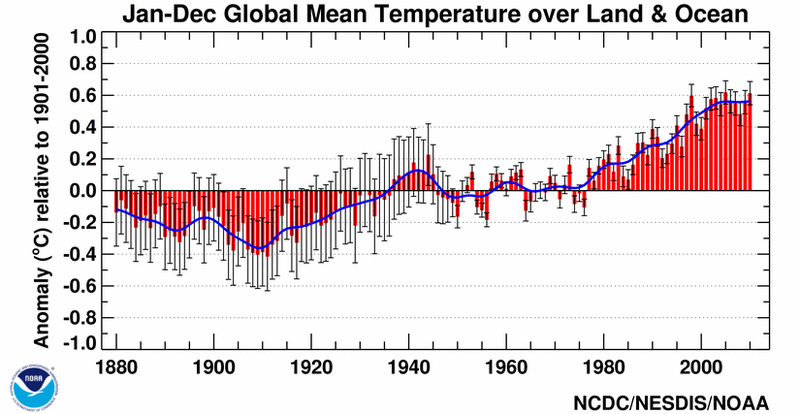 Hadcrut3: 2011 was 12th warmest at 0.340. The first 2 months of 2012 so far are 19th warmest averaging 0.204. Lower stream flow is indicative of reduced precipitation, not higher temperatures causing less snow. Reduced precipitation can be caused by lower temperatures. Is the cold N Pacific reducing evaporation? A blade of grass is only taller than the others if you are a golfer on the 18th hole or an ant walking along the green skyscraper sidewalks in your backyard green carpet. To the rest of us, there is scant different between this blade or that blade. From way out at the millennium view, these tiny temperature changes don’t even show up as vibrations, let alone a sharp rise or fall. Much ado about nothing, unless you are a golfer or an ant. Part of me is somewhat satisfied to see data going against AGW, but really, I’m happy if the planet gets warmer. What I hate most about this war on warming is that humanity has been taken away the optimism of the future. Right now, we should be celebrating that we’re coming out of the LIA. It should be something to rejoice. But no, instead we get the pro AGW scared of a warmer planet, and skeptics showing data that shows a lack of warming. Realistically, everyone should want a warmer planet. It’s always been when humanity has had the most prosperity. If humans ever do get the technology to affect the climate, they will use it to make it warmer. how would those CRU anomaly charts look if 1961-1990 (which ran fairly cold) wasnt used as their ‘normal’ period? The decline in spring extent indicates either (a) less total snow to be melted, (b) warmer spring temperatures causing the snowpack to melt faster, or (more likely) both. But wouldn’t the increace in Winter Snow Extent seem to contridict the hypothsis that there’s “less total snow to be melted”? And what about the other potential variables, e.g. (c) Atmospheric Oscillations, (d) Oceanic Oscillations, (e) Other Anthroprognic influences including particulates, snow plowing/melting, UHI, Hat Tip (Rob Dawg says: April 15, 2012 at 2:18 pm etc.)? It is cold this year in the UK, I’ve never had to carry full winter clothing on my push bike so late into April before or order a replenishment of coal for the bunker. Despite what the BBC says Bluebells are having a hard time of it. 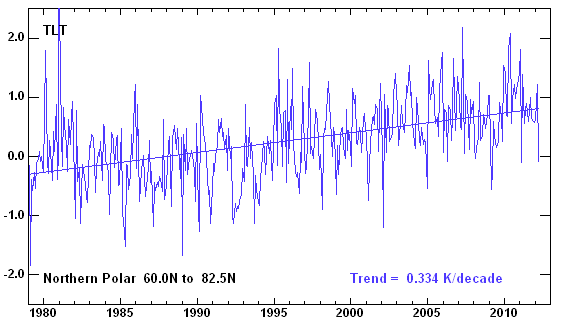 This is the change in sea level, 1992 to the start of 2012. Sea level increases are due to thermal expansion and melting of land based ice. 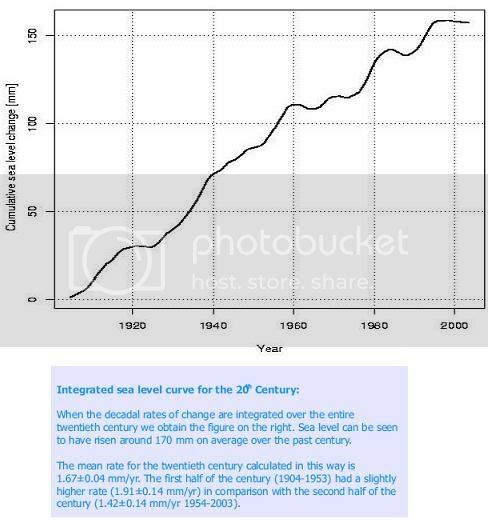 The black line is the CUSUM of the detrended data; essentially the rate of change of sea level without data loss by averaging. Spring 2007 is the srat of the slowdown and the current slowing kicked in in 2010 big time. Not necessarily. The slight increase in extent (not depth, mind you) may be due to higher amounts of weather activity, or shifts in precipitation patterns. But the decrease in spring extent (and the decrease in total yearly extent) indicates that the snow present just isn’t sticking around as long. That’s either less snow total – and/or warmer springs melting it faster. “unusual step-like behavior of global-mean stratospheric temperatures” which has resulted in a significant stratospheric cooling during the last 30 years. I can read the graph and I don’t see this. I also think drawing a cause and effect relationship here is trying to be sneaky. The density of the thermosphere is very low. Which means its energy content is very low. Which means it has negligable heating effect on the lower atmosphere. In short its irrelevant. Smells like FUD to me. Some (eg or possibly ie R. Gates) cite the 23 * 10^22 joules which have gone into the oceans as something which will come back and bite us in the a…in the atmosphere. If true, this is slightly disquieting. 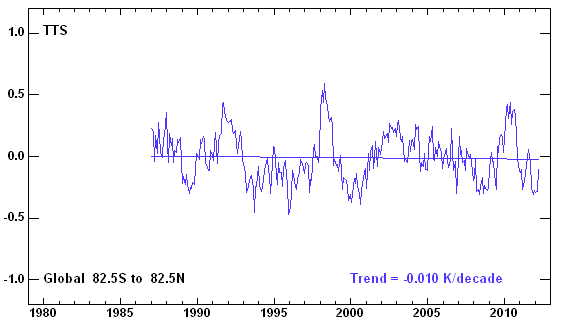 however Global Ocean Heat doesn’t appear to be “warming rapidly”. Sorry, but I am accustomed to interpreting plots of noisy data. I don’t buy this. – Global warming would cause Northern Hemisphere Winter Snow Cover to increace, but Northern Hemisphere Spring Snow Cover to decline. – Global warming would cause Northern Hemisphere Winter Snow Cover to increace, but Northern Hemisphere Winter Snow Amount/Depth to decline. 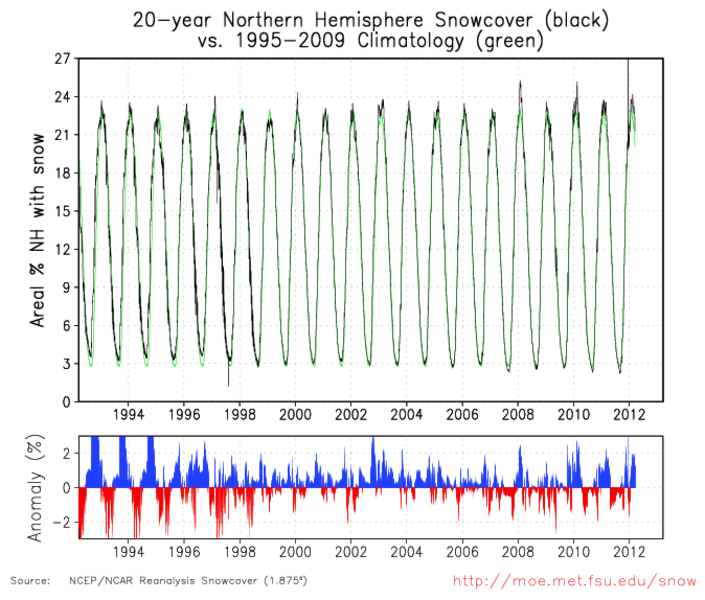 – The decreace in Northern Hemisphere Spring Snow Cover can be attributed to Global Warming, versus to an array of other climate variables, especially Atmospheric Oscillations, which are known to have major influences on Sea Ice Area and Extent: http://wattsupwiththat.com/2011/12/02/hurricanes-and-global-warming-opinion-by-chris-landsea/#comment-816893. – Even if the above points were all true, the decreace in Northern Hemisphere Spring Snow Cover represents compelling evidence of “rapid warming” of Earth. So let me see if I have this straight. In the 52 years that I have been alive, the Earth’s temperature has risen 0.5°C and the oceans have risen 5 cm (2.5″)? I don’t think I’m quite ready to give all my Helly-Hansen undies to the Goodwill just yet and how much is it going to cost me to hem-up my pants? I can’t believe these people still enjoy any amount of credibility. Ummm, could you explain what constitutes “higher amounts of weather activity” ? Hmm I find the hemispheric differences probably the most suggestive of a human signature. As far back as the 70s folks noted that there was a significant disparity in background ozone concentrations in the lower troposphere between the hemisphere’s and this was postulated to be the residual photochemical product of human activity. Now ozone is nothing like carbon dioxide in the sense that whilst being radiatively active, it nevertheless has a relatively short half life in the lower troposhere, whereas as CO2 hangs around for much longer. The disparity could be a natural product of the different land:sea ratios in the two hemisphere’s but given that even in the eightees there were plenty of credible trackings of transcontinental ozone plumes it would seem more likely that the disparity is indeed human in origin. Now whether this disparity carries over to CO2, whether CO2 differences are sufficient to cause the temperature disparity or the disparity is cuased by something else I would have to leave to other smarter people. However, some people have suggested that efforts to reduce photochemical precursors might explain some of the stalling in temperature increase we have seen in recent years. and also addresses R. Gates assumption that there is missing heat/energy, within comments of that thread. Alarming, even. An alternative view is that “Trenberth’s missing heat” isn’t there. That it has gone into deep-space, never to return. That’s why he can’t find it, and that’s why he described it as a “tragedy” in the climate-gate emails. So it may just be the size of the error in their calculations. Alarming indeed, but only to those who attach credibility to IPCC model “projections”. “Shifty about the contex”? What does this mean? Would you prefer if it read “however Global Ocean Heat Content does not appear to indicate that the planet is “warming rapidly”.? I’m not even sure how to address this, it seems like pure specultion. Can you provide any empirical evidence in support of your supposition? Here is some literature on the subject, I find no attribution to or association with Ozone. Here’s another paper, “Vertical structure of recent Arctic warming” by Rune G. Graversen, Thorsten Mauritsen1, Michael Tjernström, Erland Källén & Gunilla Svensson, Nature, 2008. Recommend postees ALWAYS do a spell check. These guys (warmists) will hammer you to no end. It supports cloud cover changes (e.g. via cosmic ray variation) as a major climate influence. In the northern hemisphere and over most of the rest of the total world’s surface, warming occurs when low-lying cloud cover decreases as albedo decreases then, but, over the expanse of Antarctic ice, the ice sheets there can be more white than the cloud tops. An April 11th “does CO2 correlate” WUWT article discusses that more. Of course, a comprehensive look would also include factors like the Antarctic Circumpolar Current’s effect. Incidentally, such as the Met Office graphs seen in this article have much historical revisionism. 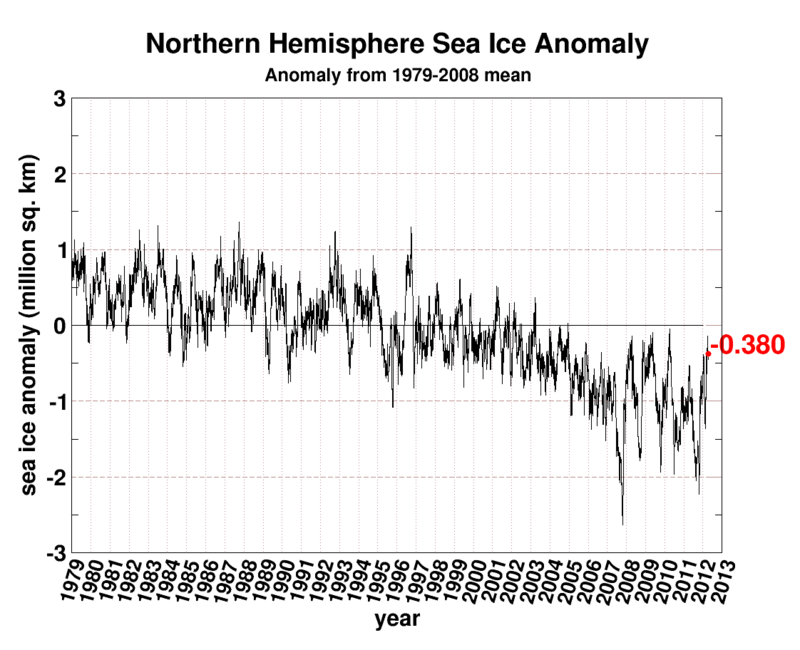 For instance, the fear of global cooling in the 1970s did not occur because previous temperatures had so next to nil decline from the late 1930s as the CRU graphs imply (even in the specifically Northern Hemisphere version of them like the CRU graph seen at http://hidethedecline.eu/media/Northern%20hemisphere%20temperatures/NHBROHANredSmall.jpg ). There is so much more that forms the big picture. michael hart – Regarding ~20×10^22 Joules, that number comes from http://www.nodc.noaa.gov/OC5/3M_HEAT_CONTENT/ – the 0-2000 meter heat content. ~20×10^22 Joules since 1961. That’s ocean heat content, which represents ~92% or so of the available mass in the climate. If that energy went into the atmosphere it would have warmed by >40C, two Hiroshima bombs/second, enough energy (over the last 50 years) to boil Sydney Harbor completely dry – every 12 hours from full up (http://tinyurl.com/725v4zn). Granted, there’s some uncertainty in the earlier OHC numbers. But I don’t think it makes a huge difference if the average energy took 24 hours to boil Sydney Harbor dry or only 6… it’s still a fair bit of heat. KR mentioned “higher amounts of weather activity”. Does that mean a faster water cycle? How much net global cooling will the faster water cycle cause? How much is that in Olympic sized swimming pools? eric1skeptic, michael hart – There doesn’t seem to be a significant trend from the data I’ve seen, but the increases in total water vapor (~4% since the ’70’s) and heat in the atmosphere _may possibly_ be resulting in more storm variations. But honestly, there’s not enough of a trend to be clear. However, given the rather small trend (I haven’t calculated whether it’s significant) in mid-winter extent, I would suspect simple changes in the weather patterns. Either way – the reductions in spring extent (10-15% over the time shown) indicate either/both a reduction in total snowfall or/and warmer/earlier springs melting the snow faster. And how many rubber ducks could float in them? 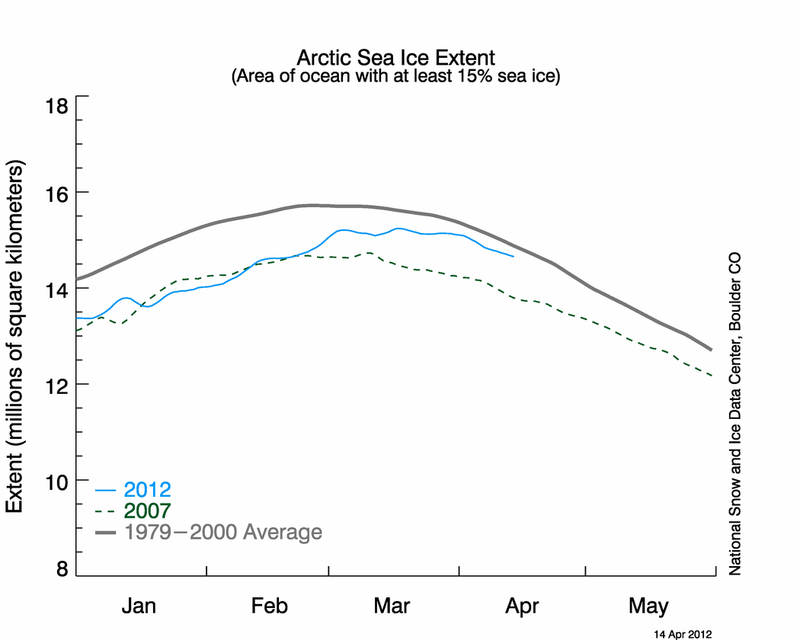 The Arctic Ice seems to be doing quite well, actually! I’m looking forward to further data later on in this melt season. It seems to me the current trend is not much different than the late 1980’s thru the early 1990’s. Why not just use an average somewhere around 30.5 or so? Looks like everything would still be about +/- a few points. Although my guess is it’s not linear I don’t believe we have near enough data to even guess what’s happening. The slope of the 1990 chart must have been horrifying. And not to mention 1967 to 1968. Wonder what happened there? Maybe I wasn’t clear enough in my earlier comment. I was responding to your comment that you couldn’t understand the difference between arctic and antarctic trends. There is plenty of evidence to show a hemispheric disparity in pollutants, my own monitoring indicates for example that in the 1990s the hemispheric background of ozone in the Northern Hemisphere was trending towards the high 30s ppb (not urban, but that blowing off the ocean), whilst the Southern Hemisphere shows a background of approximately 27 ppb. This is a disparity in background ozone concentration of approximately 10 ppb. see J.J.West et al., Geophysical Research Letters, Volume 34, 2007 for another discussion, which isn’t great because of all the modelling. The point is that background ozone is merely a marker of the presence (effect) of anthropogenic pollution (in the absence of other contributors). It also indicates that it takes a considerable time for the two hemispheres to mix. Given the disparity in ozone (and hence other anthropogenic pollutants) between the hemispheres, I am not surprised to find a disparity in hemispheric temperature trends between the Northern and Southern Hemisphere. At this point I speculate that maybe there is some link between anthropogenic emissions and the differences in warming between the hemispheres, but as I note, proving this is way beyond my ability. I also note that there is a significant difference in Land:Sea Ratios. Has no-one found a difference in CO2 between the hemispheres? towards the end of the graph. They try to claim that a good measure of “rapid warming” is to compare the 1C change over a millenia during an interglacial period which is 0.01C per decade, as they say, with the current 0.08C per decade over the last hundred years! This cherry is so big that they must have invented new equipment to pick it. Is it really OK to compare a trend over a millenium with a trend over a century now? They prattle on about snow extent, but don’t even bother to make a mention of the southern hemisphere whilst accusing skeptics of ignoring two months. What’s less relevant? Half the world or half the months, guess it’s whatever suits the narrative. Then of course there is sea ice. Where Antarctic Ice is increasing due to “complex reasons” which of course do not exist when looking at decreasing sea ice, ’cause that’s global warming obviously. 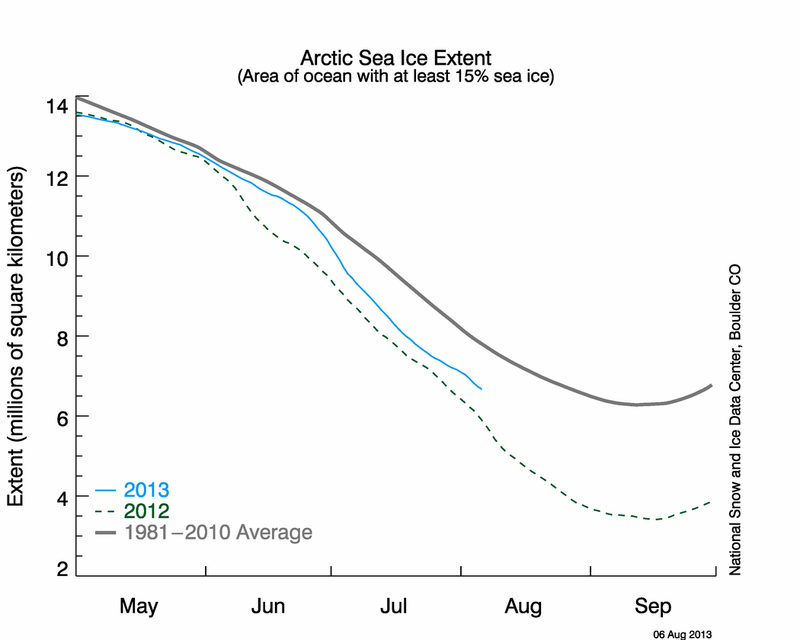 As far as I knew we were coming off an unusual high arctic ice extent in historical terms. Or is this wrong? Lastly we get to heat content, which I confess I know little about, but seems to be an odd way of measuring actual warming, especially since as Willis has shown us with his posts on volcanoes, a change in thermal input doesn’t necessarily equate to a change in surface temperature. I would like to hear other people’s input on the relevance of heat content though and where it fits in the scheme of things. They say a picture is worth a thousand words. 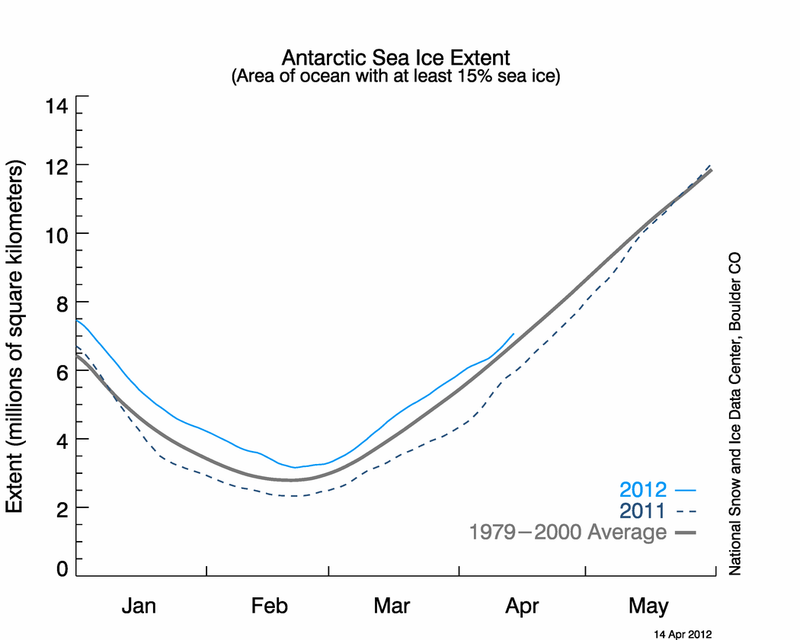 See the graphs below for slopes for four data sets from the start of 2010 to date. Darn. You mean it isn’t warming much? I was so hopeful that we’d head back to the halcyon days of the Holocene Optimum. I’m beginning to think all the excess CO2 I’m generating isn’t up to the job. …increace, but Northern Hemisphere Spring Snow Cover to decline. Decrease your use of ‘c’, Increase your use of ‘s’, and cease misspelling ‘cease’ as ‘ceace’. Correction: “cease misspelling ‘crease’ as ‘creace’. We can’t even measure the earth’s temperature. I know that. That was the first thing I learned here and no one can convince me otherwise. I also know that all my fruit froze again in buds this year, and according to the nearest approved weather station in our small town, a mile away, it was impossible. the fact these people told us more than a decade ago that AGW had overridden natural variation is prima facia evidence they are basically clueless about what is really going on. There can be no recovery for that claim now. The books are closed on it. They have been proven unreliable. One of ’em took me to task last year for omitting a preposition in the middle of a rather large paragraph. He retreated after I put “[sic]” after each of *his* grammatical goofs. 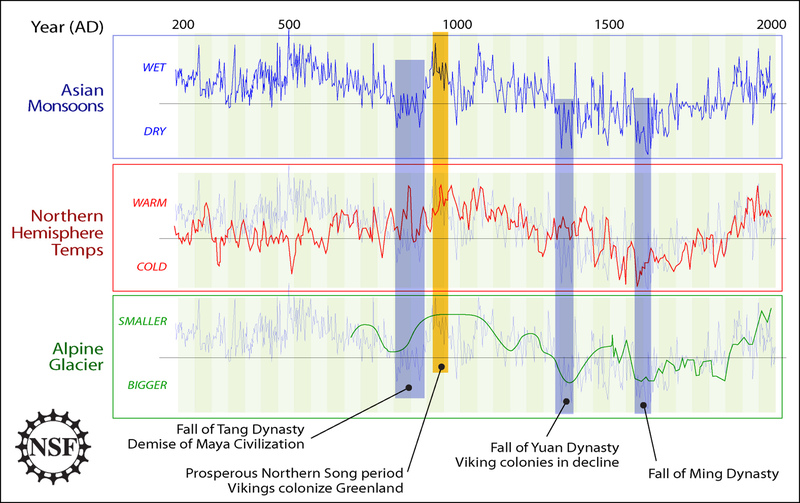 I for one am glad I do not live in the Little Ice Age and have been lucky enough to live in a time when natural climate cycles have bounced the temperature back to the more ‘normal’ levels of the short (~10,000 years) Holocene Period. 1. The Earth has warmed a little over the last century and the global temperature now appears to be stabilising, or even declining. 2. Taking the polar ice cap cover, no big deal here, just a little less than ‘normal’ in the Arctic and a little more than ‘normal’ in the Antarctic. I am a little puzzled by one thing here, WUWT’s charts show an abnormally warm 2011/12 winter for the Arctic, yet ice cover is now more extensive than in recent years. 3. 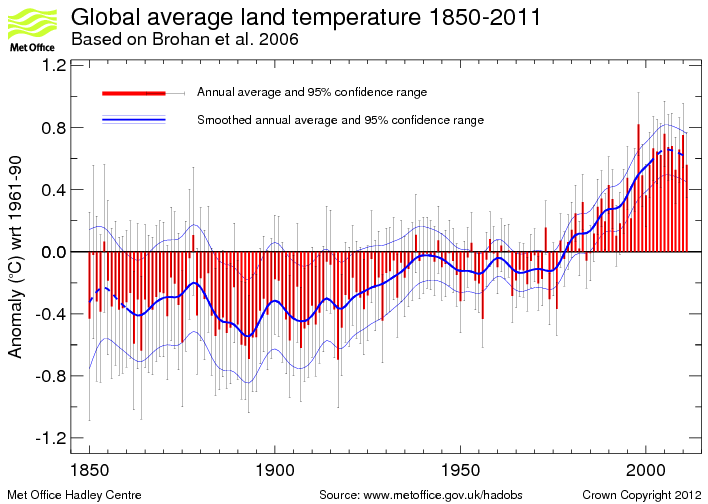 Any global temperature signature induced by the activities of man is almost not apparent. My own belief is that if man has affected global temperature, then agriculture and irrigation are as much to blame as CO2. 4. 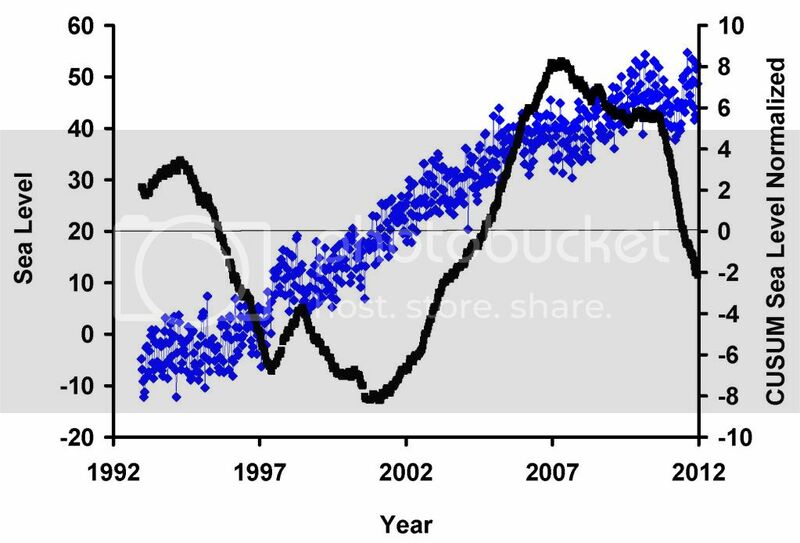 Ocean levels continue to rise extremely slowly and the rate of increase is nearly constant, although some deceleration is increasingly apparent in recent years. Any reason for alarm on climate change? As climate change is part of the natural order of things, it is difficult to say “Yes” to that. Is the global warming industry a hoax perpetuated by self interest? Difficult to say “No” to that. Do we need to spend trillions of dollars on a non-problem to support the theories of those tainted by issues of self interest (comfortable lifestyles, fame, large salaries, huge grants, etc.)? Difficult to say “Yes” to that. So either the data is going to have to be seriously adjusted in the usual well-accepted ‘climate science’ way to increase the impression of imminent catastrophe, or the whole global warming industry is going to steadily wither and die. It wouldn’t. This is clearly an increased solar insolation effect. I guess “Trenberth’s missing heat” isn’t in Sydney Harbor, then. A lot of sensible people think it is now further away than Alpha Centauri. What constitutes “rapid” and why? The question is perhaps worth some thought. Is rapid twice normal? Ten times? Is rapid less than 100 years to some critical threshold? Is it a rate beyond which key eco-systems may not be able to adapt? Does it imply adverse economic effects due to agricultural stress or infrastructure relocation within 50 years? Clearly, “rapid” will have different meanings depending on the criteria of interest. Foster & Rahmstorf 2011 (http://www.skepticalscience.com/foster-and-rahmstorf-measure-global-warming-signal.html) calculate the underlying global temperature trend (when known causes of short term volatility are backed out) to be between 0.14C/decade and 0.18C/decade since the beginning of the satellite era. If this were to persist, would any of the readership consider it “rapid”? Researchers are said to be shocked by a new study published in Nature that has found the world’s largest mountain chain, which stretches from the Himalayas to Tian Shan on the border of China and Kyrgyzstan, has lost no ice over the past decade. Well said sir! Get ’em off! Global Warming (GW) is an increase in the earth’s temperature. Anthropogenic Global Warming (AGW) is the temperature increase being CAUSED BY MAN. Catastrophic Anthropogenic Global Warming (CAGW) is the increase being caused by man is causing catastrophic devastation upon our earth. I’d like to know what the people making these stupid decisions (our elected leaders) believe. It could also indicate a tighter circulation pattern which restricts the extent to more northern latitudes. Less extent doesn’t imply less volume. What constitutes “rapid” and why? Would “appears to have increased during the last several decades” be more in line with “slight warming”? In any event, what is happening sure doesn’t match what the CAGW by CO2 folks predicted/projected at all, especially during a time when the atmospheric CO2 levels are “steadily increasing”. warrant a claim that there is going to be catestrophic global warming. It is clear the oceans are the ruler of global temps and where the oceans get there heat is the answer. I’ll be keeping my sheep skin coats, etc. From what I’ve see it looks like the average temp for the earth has been about 12.5C fro the last million years or so. I’d like it warmer, please. The really interesting thing in all of the above is in the Apparent Atmospheric Transmission of Solar Radiation curve. One wonders if anyone has noticed the distinct downward secular trend in this curve? Using a piece of paper on my screen to fit the secular trend, it looks like transmission has dropped from 0.936 to 0.927 over the 30 year timescale of the curve. That is a 1% drop in transmittivity, and it is proceeding slowly but inexorably down! I don’t have any good feel for what they are measuring, but the observatories at Mauna Loa are where they are because they are above the clouds most of the time so that this number does not reflect the change in bond albedo that is surely linked to clouds well below its height. Again, that is 1% taken off the top of global warming! As is the case with an increased albedo, it directly reduces the amount of sunlight that reaches the surface to warm it. We’re talking 1% here plus 2% from the albedo linked decrease or a total of 3% reduction in mean surface radiation. This in turn corresponds to a roughly 3 degree Kelvin expected decrease in Earth’s mean greybody temperature before the GHE kicks in. Holy Moly! That’s enough to kickstart a return to the ice age cold phase, not just another LIA! Seriously! I wonder if this is linked to the recently observed decrease in stratospheric moisture. I also wonder just where the missing sunlight is going! Is it warming the stratosphere (decreasing its relative humidity)? Mauna Loa is pretty far up there — losing 1% of the incoming sunlight before reaching it is a pretty big deal! Lol, that depends. If it is the 0.18 C/decade like we’ve seen in the last decade or so….. no. If it was some real measurements, then maybe. So, I guess it would depend on what is persisting, the temp measurements or the imaginary temp trend of F&R. Melting is not the only result of nonpermanent snow. Some of it sublimates. A lot of it sublimates actually. How ever much I don’t know exactly and I don’t think there is any measurement or modeling of this process. At least I have never come across it. How do you normally do your radiation calculations ? A 3% reduction in gray or BB radiation corresponds to only a 3/4% reduction in Temperature, and taking 288K as the mean earth Temperature (claimed by expert peer reviewed publishing climate scientists; not ignorant physicists) that comes to only 2.16 deg C drop. As for a loss of 1% of “sunlight” before reaching ML top; let’s hear it for the ozone hole repair. Ozone peels off far more than 1% of the incoming solar spectrum energy. Remember that ozone is absorbing the highest energy solar photons; not the lowest like CO2 does. So if our new clean CFC free atmosphere is achieving what it is claimed it would do, then a 1% extra solar reduction due to more effective O3 UV blocking sounds quite reasonable to me. Well Goldie, NOAA/NASA has; but then they have hidden the result. As regards CO2, the two hemispheres aren’t even vaguely comparable. In fact the globe is completely assymmetrical as regards distribution of CO2. At the south pole (and for most of Antarctica) there is only about a 1 ppm annual cyclic change in atmospheric CO2 abundance; actually -1 ppm since it is opposite in phase from the CO2 annual variations in the northern hemisphere which varies about 18 ppm for the North Pole, and pretty much over the entire arctic. So the northern CO2 variation is 18 times as much as for the Antarctic; which pits the kibosh on claims that CO2 is well mixed in the atmosphere. Just try swigging 18% alcohol beer, and comparing the result to swigging 1% alcohol (near) beer, if you think 18 times is not a significant difference. Compare to the milli-degree Temperature changes that people go ape about in a year, I would say the hemispheric difference in CO2 is somewhat non negligible. I beg to differ. Beer is one thing. But CO2 is quite another. Over the last 15 years, the CO2 concentration went up about 25 ppm. Check out the graph below to see how much difference 25 ppm made over the last 15 years according to RSS. The beer analog for anyone to whom it wasn’t plainly obvious, was to impress on the reader the significance of an eighteen to one difference in behaviour; between two well studied global regions when the party line is that the subject material is well mixed globally. And for 25 ppm change out of say 392 ppm, the log of the ratio is about 0.095, so one would expect about 0.3 deg C change for the IPCCs 3 deg C per doubling. And at the north pole, that 18 ppm excess CO2 is removed from the atmosphere in just five months, , so that’s less than a year and a half ro deal with your 25 ppm. So much for 200 year CO2 residence time. I am amazed at how off course the discussion here has become. 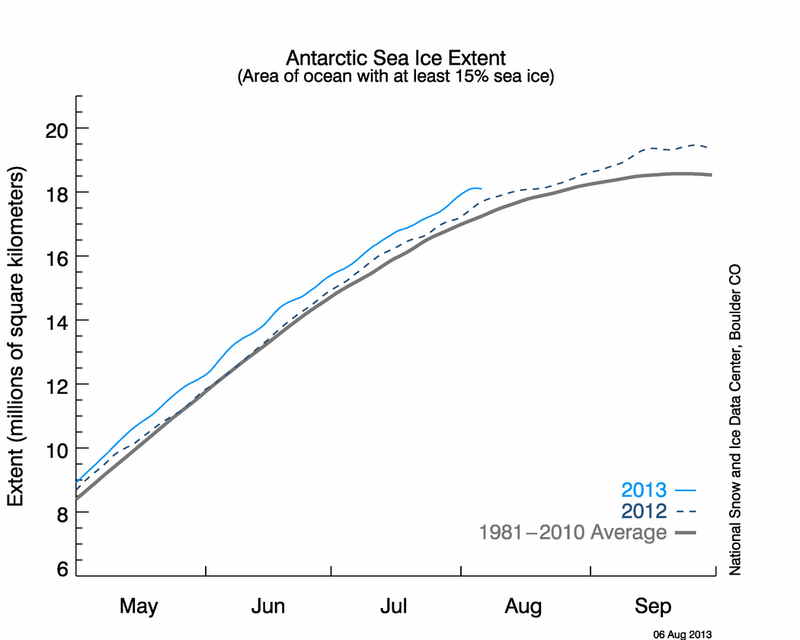 Spencer has made it clear on his website, that it is his mission to debunk the idea of AGW. So now he comes up with some mysterious algorithm to show it hasn’t really been getting warmer. and the RSS satellite data shows a similar trend. The burden of proof is on Spencer to explain how why his analysis of station data deserves to be considered seriously. Wake up people! The above is the northern hemisphere but with that most relevant since there is far less net temperature change in the southern hemisphere. Roy Spencer’s April 13th article notes the USHCN claims 0.245 degrees Celsius per decade temperature rise. When writing fast, I don’t think I explicitly noted in the prior comment that USHCN is U.S. and UAH is global, but the point is how misleading a 0.245 degrees Celsius/decade claim is overall when global temperatures have risen in the past three decades at <=~ 0.1 degrees Celsius/decade (a rate like they have naturally in the past long before). Of course this then means that the north pole does not permanently have either an excess or a deficiency of 18 ppm but rather a smooth transition. So then at the most, the average difference between the north pole and south pole is 9 ppm. And with regards to the IPCC 3 C per doubling, that assumes positive feedbacks that Spencer and others do not agree with. So if we assume negative feedback and perhaps 0.8 C per doubling and if we use 9 ppm instead of the 25 ppm as used above, then perhaps we have closer to 0.03 C difference. Right? This claim is as ridiculous as it gets. 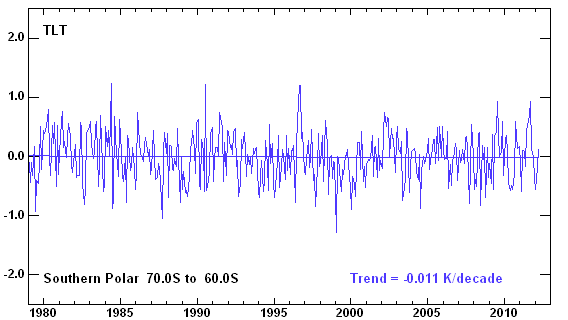 His own UAH data set shows that the rate of warming on average since 1979 has been about 0.14C/decade: Wake up people! The 0.14/decade was globally, but was Dr. Spencer not discussing U.S. only here? Douglass and Knox have recently published a paper on Ocean Heat content (OHC) showing that the recent warming rate is essentially zero. In an earlier study of ocean heat content (OHC) we showed that Earth’s empirically implied radiation imbalance has undergone abrupt changes. Other studies have identified additional such climate shifts since 1950. The shifts can be correlated with features in recently updated OHC data. The implied radiation imbalance may possibly alternate in sign at dates close to the climate shifts. The most recent shifts occurred during 2001–2002 and 2008–2009. The implied radiation imbalance between these dates,in the direction of ocean heat loss, was −0.03 ± 0.06 W/m2, with a possible systematic error of −0.00,+0.09] W/m2. The paper was published on line Feb 17, 2012 in Physics Letters A vol 376 p1226-1229. We also pointed out that there is no evidence for any “missing heat”. Well Werner, to be completely open kimono about it, I used the IPCC number solely because that is (purportedly) the “consensus” value. Actually I place no credence in it. I also assume nothing about any feedbacks; which in my view, would affect the actual driving signal; which is the solar input. And If I believed in the concept, I would certainly take Dr Roy Spencer’s input, before any IPCC concensus. But I also don’t even believe in the concept of a fixed Global Temperature increase for any doubling of atmospheric CO2 abundance. I have an aversion to accepting any premise for which there is neither experimental observational supporting data; nor theoretical physical foundation for. I do have a degree in mathematics, so I do know what a logarithmic function is, and any purported linkage between mean global surface Temperature, and atmospheric CO2 abundance, is clearly not logarithmic; nor for that matter any other defined mathematical function (known to me). And since John Christy et al showed that oceanic near surface water Temperatures, and near surface oceanic air Temperatures, are not correlated, I don’t even believe the “data”, let alone the theory.